For example, RNs must hold a hospital diploma, associate’s degree in nursing (ADN), bachelor of science in nursing (BSN), or master of science in nursing (MSN). They must also pass the National Council Licensure Examination for Registered Nurses (NCLEX-RN). RNs perform advanced duties that require this specialized training. They administer medicines, operate complex medical equipment, perform diagnostic tests, analyze results, and establish patient care plans. RNs have supervisory duties as well, often managing junior nursing staff. Practical nurses check vital signs, administer wound care, give injections, insert catheters, and report patient concerns to doctors, physicians, and RNs. Aspiring LPNs must complete a state-approved certificate, diploma, or associate’s degree program in practical nursing. Graduates must pass the NCLEX-PN national licensure exam before practicing. Nursing assistants help patients with routine activities such as bathing, dressing, and grooming. They reposition patients, transport them, sanitize patient areas, and change linens. CNAs also take vital signs and record patient health concerns. They must complete a short training program and pass a state certification test. Licensed CNAs often hold additional certifications, like certified medication aide (CMA) or geriatrics, to enhance their employment prospects. Many Ohio nurses earned their degree or certificate at a local school. Aspiring nurses in Warren, Ohio, have access to top local schools like Kent State University and Trumbull Career & Technical Center. These two schools run the gamut of nursing programs. For example, Kent State’s Trumbull campus provides ADN and BSN prelicensure pathways, as well as an RN-to-BSN degree completion program. Trumbull Career & Technical Center offers a CNA certificate. Graduates of these nursing schools are prepared for positions at major local healthcare centers like St. Joseph Warren Hospital, Trumbull Memorial Hospital, Northside Medical Center, and Akron Children’s Hospital. Depending on the position, the annual salary for nurses in Warren, Ohio, can range from $24,000 for entry-level CNA roles to $92,000 for advanced practice specialties. 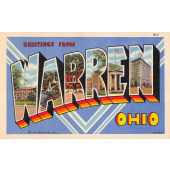 If you want to launch your nursing career in Warren, Ohio, we have you covered. Below we’ve compiled a complete list of the city’s accredited nursing schools to help you get started.